My passion for cricket began due to my grandfather Bashir Haider. He was a pace bowler who played first-class cricket and also played a few matches for Pakistan A. He would take me along to his matches when I was very young and encouraged me to bowl. I would watch his bowling with great interest and even at that age, I dreamt of becoming a fast-bowler one day. I told my family members that one day I will also become a fast bowler, and my family really supported me in my quest to become a professional cricketer. My father was also a keen follower of cricket and he encouraged me to fulfil my dream of becoming a cricketer; however, he also stated to me that I should not ignore my studies and ensured that I studied as well as played cricket. I went to school at Government Model High School in Vehari and was captain of the cricket team in 2009. The coaches at the school really helped me with my early development as a cricketer, but it soon became apparent that if I wanted to become a professional cricketer, I would have to move away from Vehari and look to develop as a cricketer in a larger city where there were better facilities. Vehari is famous around the world for the great pace-bowling legend Waqar Younis who is of course from Burewala. Waqar has inspired many pace bowlers from Vehari, Burewala and Gaggo Mandi and this region produces a lot of pace bowlers such as the aforementioned Waqar Younis, Mohammad Zahid, Nadeem Iqbal and Mohammad Irfan. I played at the Under-16 level for Multan Region alongside the pace bowler Zia-ul-Haq, and I had the pleasure of working with Nadeem Iqbal who was working as a coach for Multan Region. However, the problem was that facilities in Vehari were limited and the chances to impress were few and far between. My father said to me that if I was serious about making it as a cricketer, I would have to make some sacrifices and leave Vehari and move to Lahore. I moved to Lahore with my mother, sister and brother, whilst my father carried on living in Vehari as he had been working there for 25 years. This move was a big change for me and one that has turned out be the turning point of my career. My family and I also realised that moving to Lahore to pursue my dream was a risk, but one that I had to take if I wanted to succeed. The first time I went for trials in Lahore at Model Town Cricket Club, I was really nervous as there were so many cricketers at the trials and I thought to myself, am I going to impress the coaches or will I just get lost amongst the other guys trying to attract the attention of the coaches? Model Town Cricket Club is a very famous club in Lahore and the likes of Azhar Ali, Usman Salahuddin and Imam-ul-Haq play there and it's not easy to play for such a high-profile club where competition for places is so tough. I went there for a couple of weeks and practised there and then got a chance to play a match for them. In my first match, I took 2 wickets in 4 overs and the coaching staff there were very pleased with my performance. Initially, I played some friendly matches but then I became a regular pick in the actual competition matches and in tournaments. While I was playing for Model Town Cricket Club in 2010, I went for trials for the Grade II team Sayid Paper Mills. I was 16 at the time and the coaching staff there were very impressed with me. One of the coaches suggested to me that I should attend Under-16 trials for Lahore region. So, whilst I was unsuccessful in the trials for Sayid Paper Mills, I was picked by Lahore Region Under-16s at their trials. I played 5 matches for Lahore Region Under-16s and took 9 wickets in the Pepsi PCB Cricket Stars Under-16s Tournament 2010/11. These three seasons were a complete loss for me as I did not feature in any Under-19 or Grade II cricket and just concentrated on playing club cricket in Lahore. I went for Under-19 trials for various teams and departments but I wasn't successful and I was pretty down at that time and was worried about my future in cricket as wherever I turned, the door was being slammed on my face. Thankfully, I was still playing club cricket and that kept the flame burning as far as the passion for cricket was concerned. I went for trials for Lahore District Under-19s and there a former pace-bowler Saud Khan who was one of the coaches spotted me. 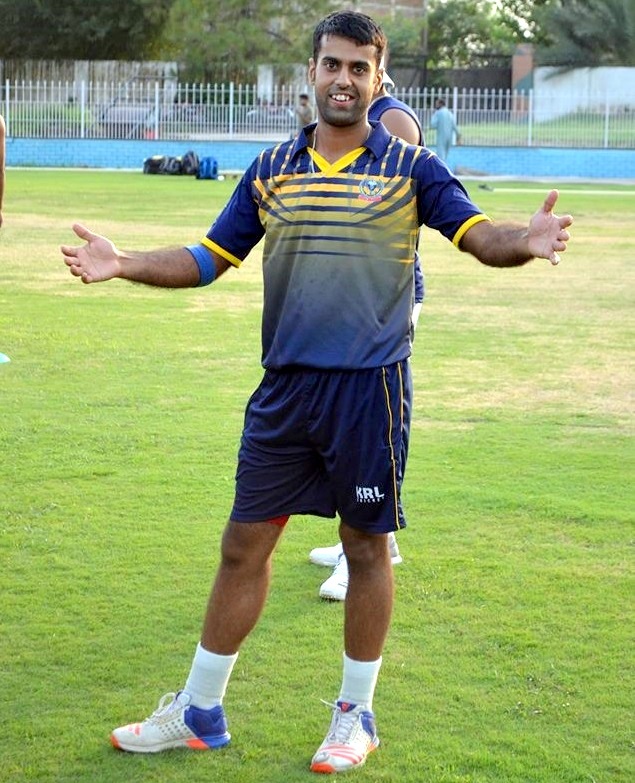 The trials were at LCCA Ground in Lahore and I bowled really quick and well at those trials. I was selected for Lahore District Under-19s and played three matches for them in the Inter-District Under 19 Tournament 2014. My name was then included in the trials for Under-19 Lahore Region and once again, I bowled well at the trials where I swung the ball and was finally selected by Lahore Region Under-19s. This was really important for me as this was my final year for qualification as an Under-19 player and my last chance at this level, but thankfully things turned out in my favour. I played a full season for Lahore Eagles Under-19s and I ended up as the one of the highest wicket-takers in those Inter-Region Under-19 tournaments, taking 42 wickets in 9 matches. Six of these matches were three-day fixtures and the other matches were 50-over fixtures. Having concluded my days as a Under-19 cricketer, the next step was to try and find a first-class team. With some very good statistics in my final season as an Under-19 cricketer, I was hopeful that I would get an opportunity in first-class cricket, but you can never be too sure. Thankfully, Lahore Eagles gave me a chance and I made my first-class debut for them in November 2014 against Karachi Zebras. I played two matches in my debut season, taking six wickets. In December 2014, I toured Kenya with Pakistan Under-19s. It was a short 10-day tour comprising of five 50-over matches. I played in three of the matches but I wasn't happy with my performance on that tour and only took two wickets. I came back from the tour of Kenya with Pakistan Under-19s and played for Brighto Paints in Grade II cricket, taking eight wickets in three matches. After that, I represented Lahore Blues in first-class cricket and took 28 wickets in 6 matches. During that season, I played against KRL in Hyderabad and bowled very well against them and their coach Jaffar Nazir and manager Rashid Iqbal were very impressed with my bowling. In 2016, I once again played for Brighto Paints in Grade II cricket and it was at this time that I signed for KRL. It was good to sign for such a high-profile team like KRL, but I've been a bit disappointed with my overall performances for them so far. My aim has been to take 50-60 first-class wickets per season but that has not happened as yet. My intention was to also get noticed and picked for a Pakistan A tour, but that is still yet to happen. At the moment, my pace is around the high 130s (KpH), but I am confident that I can bowl quicker than what I am at the moment and would like to take it to the 140-145 KpH mark. I'm going to work on a few things at the end of this domestic season as I feel I can improve as a bowler and increase my pace. I've already spoken to the coaches and trainers about a fitness plan for me to implement when the season finishes, and am also working on some technical aspects of my bowling. I feel that I have done pretty well on pitches that aren't too favourable for pace bowlers. I took three wickets in the first match and took a couple of wickets in the second match too, but I feel that I could have done better with the occasional over letting me down and going for runs. My aims are to add consistency to my bowling, increase my pace and get picked for Pakistan A and to earn a Pakistan Super League contract. This current season is really important for me as I want to work on my bowling and come back next season a better all-round bowler.